Home » Candy Shops » Who is Chocolatier Extraordinaire Josephine Vannier? Paris is heaven for chocolate lovers. (Sorry, Switzerland and Belgium, but you know it’s true!) And there are many boutiques run by world-class chocolatiers in the City of Light that should not be missed by sweets connoisseurs—Christian Constant, Michel Cluziel, Pierre Herme, Jean-Paul Hevin and Patrick Roger, to name just a few. But one of my favorites is a Marais shop that is a bit of an enigma—Josephine Vanier on the Rue du Pas de la Mule just steps from the elegant Place des Vosges. The mystery certainly isn’t the fantastic chocolate concoctions produced by the artisans at Josephine Vannier. The puzzler is just who Vannier is. And no one seems to know. Even celebrity cookbook writer and food blogger David Lebovitz, who has made Paris his home for many years, can’t figure it out. 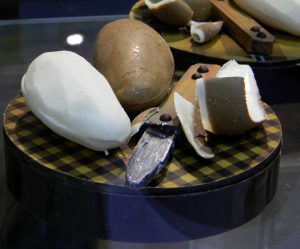 So, ponder that peculiar mystery while you peruse the fantastic chocolates and chocolate “sculptures” created by that shop’s team of artisan chocolatiers. Individual chocolates that can be mixed and matched in various-sized assortment boxes (including a variety of boxes actually made of chocolate) consist ofsuch offbeat (but delectable!) ganache flavors as jasmine and green tea, pear and jasmine, mint tea, Ethiopian café mocha, basil and dark chocolate, mint and strawberry, and passion fruit and Tonka bean (a commonly used vanilla bean substitute). Pralines include coffee; gingerbread, orange and cinnamon; almond, chestnut and hazelnut paste; nougat with cinnamon; and ginger. Most are offered in milk- and dark-chocolate variants. Among other small chocolate-covered treats are candied orange “wheels,” dark chocolate “tongues,” candied orange or lemon peels, candied ginger, roasted hazelnuts wrapped in caramelized sugar, nougat with cardamom, and Grand Marnier-flavored almost paste covered in white chocolate. And while these all sound—and, indeed, are—delicious, they only scratch the surface of the eclectic products available at Vannier’s Marais boutique. 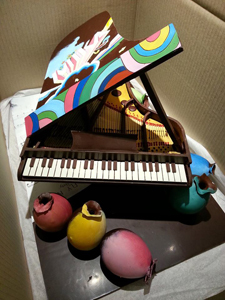 During my many visits, I’ve spotted fantastical chocolate sculptures of electric guitars (see photo to the left), men’s and women’s dress shoes, human skulls for Halloween, globes, maps of France, artists’ palettes with paint brushes, Easter baskets, wine bottles, fruit platters, miniature baby grand pianos (see photo below) and so much more. The craftsmanship is simply out of this world. In many cases, had you not been inside a chocolate boutique you’d likely not recognize that these show pieces are made entirely from chocolate—and are 100% edible. Best of all, new pieces are routinely introduced to reflect upcoming holidays and, more often than not, the current whimsy of the chocolatiers working at the shop. 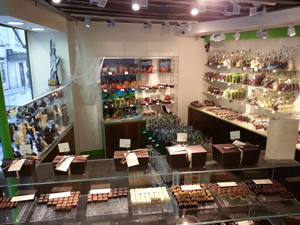 Yes, the individual chocolates are a bit pricey (but actually less expensive than at some of the aforementioned “destination” chocolateries, and in some cases significantly less so). And the sculpture pieces are both costly and relatively fragile, so getting them back home in one piece would be difficult to impossible for tourists. But even if you can’t afford more than just a couple of ganaches and a praline or two to nosh on, it’s well worth your time to stop in and check out the latest pieces by the cutting-edge chocolatiers at Josephine Vannier. Think of it as art, not commerce. And you can always do what I do—buy a small chocolate magnet (yes, magnet) with carved images of Paris’s best-loved landmarks. Its’ a steal at just 5 Euros! 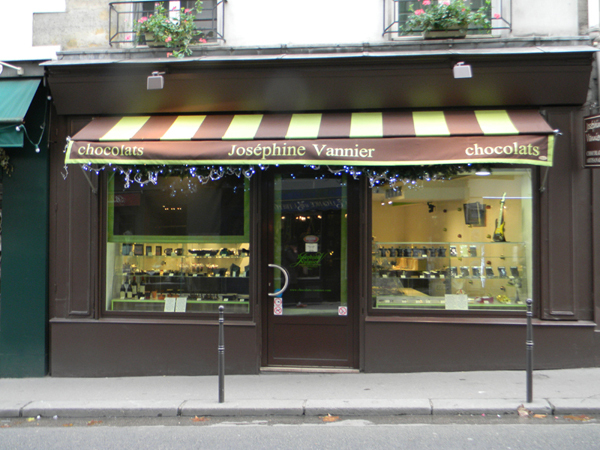 Josephine Vannier is located at 4 Rue du Pas de la Mule in the 3rd Arrondissement (Metro: Chemin Vert). The boutique’s hours are Tuesday-Saturday 11 a.m.-1 p.m. and 2-7 p.m., and Sunday from 2:30-7 p.m. The shop is, however, closed for summer vacances and will reopen on Aug. 23. This entry was posted in Candy Shops, Food, Marais, Right Bank, Shopping and tagged chocolate, Chocolaterie Josephine Vannier by Bob Adams. Bookmark the permalink. One of my sister who lives in Paris and not far from J.V sent me pictures of her art. My husband was very puzzled about all the different shoes, saxophone, cafetières etc and I started wondering and pondering as how she does all her magic. Does she use mold ? Does she make them by hand, using delicate cutting instruments ? J.V is a fantastic artiste, or artistes, as it seems no one knows who she/they really is/are.